Inner 10 has teamed with Ballistic Betties to provide world-class firearms and self-defense training to all women from neophyte to proficient. Our instructors are committed to provide you, our members, a comfortable and safe environment to continuously improve your self-defense capabilities and skill-at- arms. We offer several types of women’s only classes to fit your busy schedule. For a quick block of training spend an hour or two at Betties Night at the Range or Basic Gun Cleaning class. Need to increase your comfort level, register for our Intro Ballistic Betties course whether you are a brand-new shooter or added a new gun to your collection. Time to step up your training then enjoy a half day advance skill set course. Women recognize that there is more to training than just shooting a few rounds at the range. After one class, your confidence levels skyrocket as your sense of empowerment increases. Ballistic Betties provides the knowledge, the tools, and the environment that creates confident and proficient women shooters. Ballistic Betties members work together to provide support and form lasting bonds in a fun and safe environment. 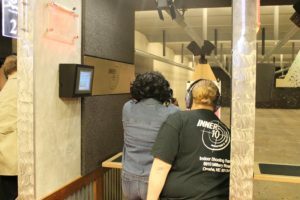 Betties Night at the Range – After a basic safety and shooting review, attendees will have the opportunity to shoot a variety of different firearms under Instructor supervision. Betties Gun Cleaning Basics – This class will help you learn nomenclature and disassembly while teaching you to care for your firearm. Betties Defense – Provides training in the mental, physical, psychological aspects of empty handed defense. Betties Immediate Action Drills – This class will help you master magazine changes, reloading, and malfunctions. Intro to Ballistic Betties – A great opportunity to get everything you need to know as a new shooter or gun owner. Ballistic Betties – 4 weeks to Conceal & Carry Confidence – This 4-week class will cover a wide array of information specific for the woman looking to be comfortable with her daily carry choices and skills. Ballistic Betties Above & Beyond – After completing our Intro course, these training classes are dedicated to advancing skills levels.